Students make their name with masking tape and then paint over the entire paper using many colours. 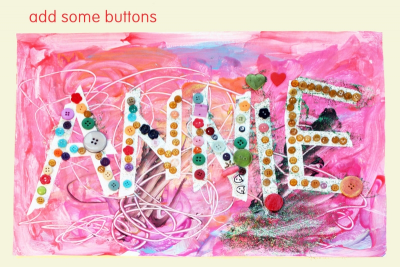 Once the paint is dry they remove the tape and decorate their name with glitter glue and buttons. Use a pencil to print your name on the paper. Make it nice and big. 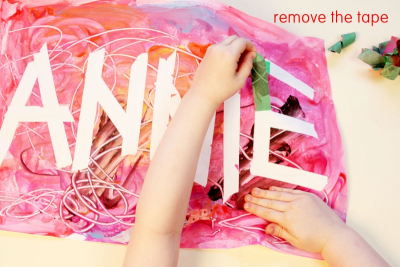 Cover your name with masking tape. Press the tape down with your fingers. Make sure it is good and flat. 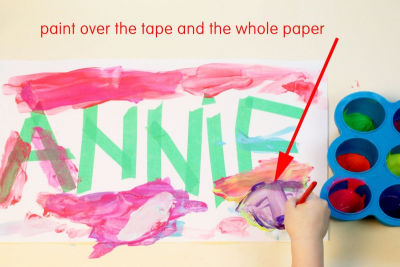 Paint over the tape and cover the whole paper. Use lots of different colours. 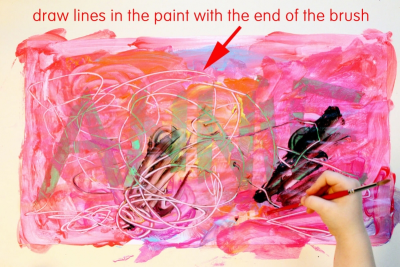 Draw some lines in the wet paint with the end of your brush. 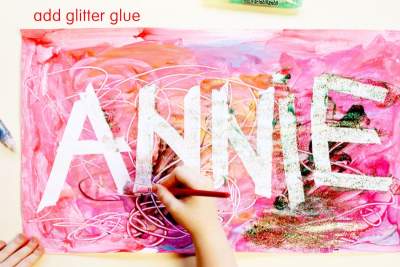 Add glitter glue to make your name sparkle. Prior to this lesson have children practice printing their names. Gather, and make available, alphabet books and books about names, for example, The Name Jar, by Yangsook Choi; Naming Ceremonies, by Mandy Ross; My Name Is Yoon, by Helen Recorvits; Eating the Alphabet, by Lois Ehlert; Star Wars ABC-3PO: Alphabet Book, by Calliope Glass, Caitlin Kennedy, and Katie Cook; Animal Alphabet: Slide and Seek the ABCs, by Alex A. Lluch; and M Is For Mountie: A Royal Canadian Mounted Police Alphabet, by Polly Horvath. Depending on your students, you may decide to print the names on the paper and/or apply the masking tape ahead of time. Set up a painting centre with masking tape, paint brushes, paper, pencils, washable paint, buttons, glitter glue, white glue and paper towels. 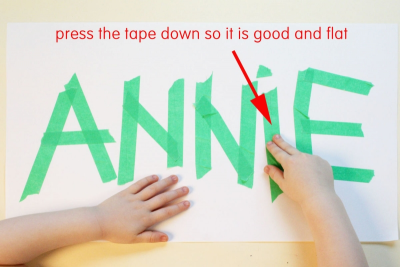 Invite several students to stick masking tape on a chart paper. Have some volunteers paint over the tape and paper. Talk about what they think has happened to the tape. Have students guess what they think will happen when they remove the tape. Ask a student to remove one of the pieces of tape. Discuss what happened when the tape was removed. Have several students remove the rest of the tape. 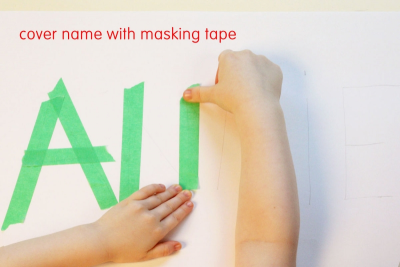 Make your name with masking tape. 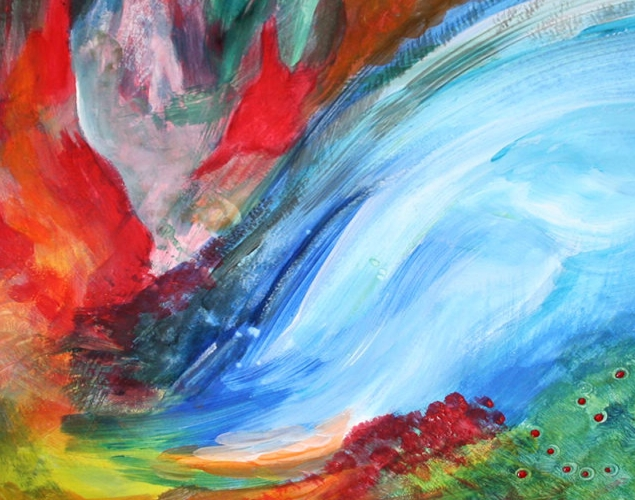 Use your own ideas to make a mixed media painting. - what they like best about their paintings. Display the paintings in the classroom. 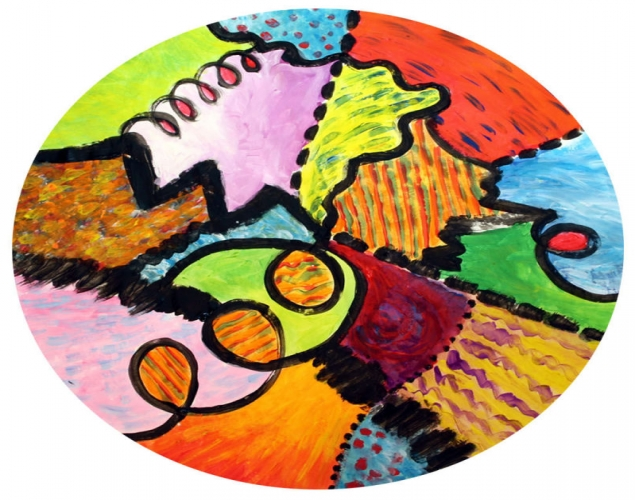 Encourage students to view the paintings and notice how they are the same, and how they are different.